Yes, it's that time again: The Pumpkin Spice Latte officially returns to Starbucks stores across the country on Tuesday, bringing an objectively premature wave of fall flavor amid the heat of late summer. But if sweet, spicy, and pumpkin-flavored coffee isn't your thing, it turns out the coffee giant has a fall-themed alternative for you to sip -- though, hopefully, not until the leaves to start to change and it's not 90 degrees outside. Along with the arrival of the PSL, Starbucks announced it is also bringing back the beloved Salted Caramel Mocha for the season. As you may recall, the rich drink is made by mixing mocha sauce, toffee nut syrup, espresso, and milk. It comes topped with whipped cream, caramel drizzle, and a fancy blend of turbinado sugar and sea salt, according to the company. Sure, it's no antidote to the super-sugary orange swirl of pumpkin spice, but at the very least, it's decidedly less basic. 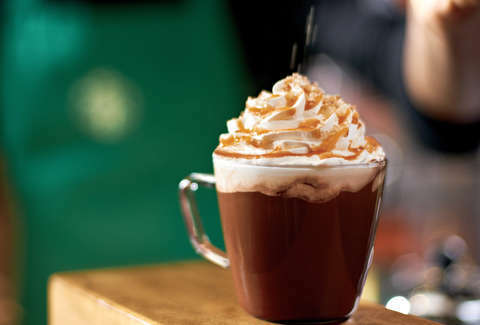 Starbucks previously offered the Salted Caramel Mocha for limited runs in recent years, while the PSL is now in its 15th year. This time around, both drinks will only be available in the United States and Canada while supplies last. As far as fall food options go, Starbucks said it's adding three new items to its baked goods lineup -- Maple Pecan Muffins, Apple Cider Doughnuts, and Morning Muffins -- along with returning favorites like Pumpkin Scones. Starbucks describes its Apple Cider Doughnuts as "flavored with apple cider and balanced with sweet vanilla icing" and topped with "a sprinkle of turbinado sugar," which makes it perhaps the most exciting addition to the pastry case this fall. Who doesn't love a good apple cider donut? Of course, it's almost certainly too early (and too hot) to order any of these things, but at least you'll have plenty of options to help celebrate fall when the time is right.